Brown adipose tissue has played a key role in prevention research since its presence was first documented in adults. However, there was no non-invasive method of measuring its heat generation. A team at the Technical University Munich (TUM) and the Helmholtz Zentrum München has now succeeded in making the activity of brown adipose tissue visible without injecting substances. Until now, it has only been possible to measure the heat output of brown adipose tissue by means of invasive methods. 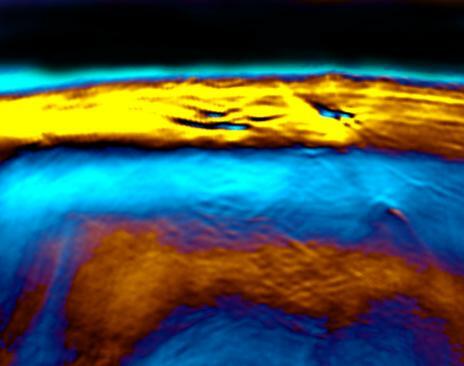 This approach involves the injection of radioactive substances called "tracers" which participate in the metabolism, making it possible to observe the heat conversion in the tissue. However, a team from Helmholtz and the TUM has developed a new, non-invasive method. After establishing its viability in mice, the initial measurements in humans have also been successful without the need to inject imaging agents. The team of researchers demonstrated a relationship between the metabolic activation of the tissue and changes in oxygenated and deoxygenated hemoglobin (red blood pigment), measured by means of multispectral optoacoustic tomography (MSOT). Professor Vasilis Ntziachristos, Director of the Chair for Biological Imaging at TUM and the Institute of Biological and Medical Imaging at Helmholtz Zentrum München has pioneered MSOT explains the new investigative method as follows: "A laser beam sends light pulses approximately two to three centimeters deep into the tissue. This light is absorbed by tissues containing hemoglobincausing them to minimally warm up and transiently expand. This expansion creates sound waves which can be measured." The study demonstrated a direct relationship between the metabolic activation of the brown adipose tissue measured using hemoglobin gradients as an intrinsic biomarker of tissue metabolism and its calorie consumption after stimulation. "Overall we expect MSOT to become a key tool in measuring metabolic parameters in tissue, using portable and safe MSOT technology" notes Prof. Ntziachristos. He adds: "this ability can revolutionize understanding of metabolic processes not only in patients but also in healthy individuals". "The higher metabolic demand of the brown adipose tissue is supplied by increased blood circulation and oxygen utilization, which can be made visible in the tissue and the venous outflow by MSOT" explains Professor Martin Klingenspor from the Chair for Molecular Nutritional Medicine, one of the main authors of the study which was published in "Cell Metabolism." "This means that blood flow and changes in oxygen saturation in blood are markers for metabolic output." Josefine Reber, Monja Willersh€auser, Angelos Karlas, Korbinian Paul-Yuan, Gael Diot, Daniela Franz, Tobias Fromme, Saak V. Ovsepian, Nicolas Beziere, Elena Dubikovskaya, Dimitrios C. Karampinos, Christina Holzapfel, Hans Hauner, Martin Klingenspor, and Vasilis Ntziachristos: Non-invasive Measurement of Brown Fat Metabolism Based on Optoacoustic Imaging of Hemoglobin Gradients, Cell Metabolism 03/2018.